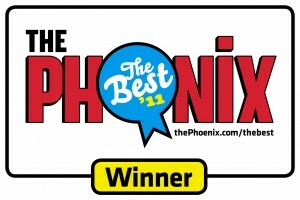 Momentum Fitness Voted Best Health Club in Providence- The Phoenix! We want to thank everyone for voting for us! We were voted the Best Health Club in Providence, RI! We’re thrilled that all of our current clients like what we’re doing here, and obviously without them we wouldn’t stand a chance at being voted the Best Health Club. If you haven’t been to Momentum Fitness yet, and you are thinking about starting an exercise program, give us a call or stop by anytime. We provide a unique and personal work-out experience…..an alternative to the traditional big gyms. Here’s what The Phoenix had to say…..